PreS-K–Fire safety is always a timely topic. 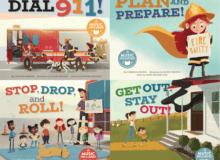 This series blends music (CD included) with a catchy rhyming text to provide an upbeat and proactive look at being safe during a fire emergency. Each title stands alone, focusing on one important fire safety rule, such as calling 911 or planning and preparing an exit strategy at home. The entire series offers a cohesive, full-bodied look at fire safety without scaring young learners. The cartoon artwork has a vintage vibe. The music is also downloadable via a QR code. VERDICT A strong contender to update fire safety protocol in public and school collections. ea vol: Ghigna, Charles. illus. by Glenn Thomas. 24p. (Fire Safety). further reading. glossary. w/CD. Cantata Learning. Sept. 2017. lib. ed. $33.99. pap. $7.95.